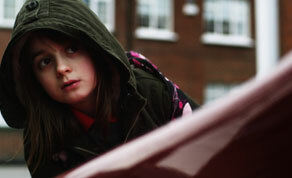 Ella Connolly stars as Lucy in 'Eliot & Me'. Irish actress Ella Connolly wins two awards for ‘Eliot & Me’ at the 12th China International Children’s Film Festival: the International Jury Award for Best Performance by a Child Actress and the Award for the Children’s Favorite Child Performer. Famous Chinese actress Jiang Wenli chaired the international jury and singled out Ms. Connolly’s performance as “compelling and authentic, with a naturalness rare in child acting. Her character was very believable”. The second award was voted by the children’s jury, which is made up of 200 children from local primary and middle schools. The festival, held every two years, took place in Siping City in northern China. Over 500,000 children watched the films in the weeks leading up to the festival. ‘Eliot & Me’ was the first Irish film to be selected for the festival and the only English language film screened in the competition. Funded by the Irish Film Board and RTÉ, the film tells the tale of 10 year-old Lucy and her efforts to find her missing dog. The script was developed and co-written by Connolly and producer Fiona Bergin. Director of photography was Owen McPolin (‘Ripper Street’) and editing was done by Guy Montgomery (‘Parked’, The Clinic’). Post production was done in EGG. ‘Eliot & Me’ has screened at the major children’s festivals in Germany, Holland, Belgium, Finland, Greece, Romania and the US. It will have its Irish premiere at Cinemagic in Belfast on 12th October. The one hour long drama was made by Fubar Films with the participation with the Irish Film Board in association with RTÉ. The film’s visit to China was supported by Culture Ireland. Contact details for Fubar Productions on IFTN .